The District of Columbia (DC) can claim bragging rights as it has been deemed the most innovative part of the US, according to a study by personal finance website WalletHub. WalletHub says innovation is a principal driver of US economic growth. In 2016, the country spent an estimated $514 billion on R&D – “more than any other country in the world” – helping the nation rank No. 4 on the Global Innovation Index. According to WalletHub, certain states are due more credit than others for America’s dominance in the tech era. These states continue to foster innovation through investments in education, research and business creation, especially in highly specialised industries. In the report, “2017’s Most & Least Innovative States”, WalletHub’s analysts compared the 50 states and the District of Columbia across 18 key metrics. The data set ranges from the share of science, technology, engineering and mathematics (STEM) professionals to R&D spending per capita to average internet speed. So while it’s certainly not purely fintech, it’s still an interesting and informative report on the nation’s tech and innovation scene. Some of its key findings reveal that DC has the highest share of STEM professionals, 9.4%, 2.8 times higher than in Mississippi and Nevada, which have the lowest at 3.3% each. DC has the fastest average internet speed, 22.47 Mbps, 2.1 times faster than in Idaho, which has the slowest at 10.65 Mbps. DC also has the highest share of public high-school students who completed advanced-placement (AP) exams, 60.2%, 4.4 times higher than in North Dakota, which has the lowest at 13.8 percent. Virginia has the highest share of technology companies, 7.52%, 3.9 times higher than in West Virginia, which has the lowest at 1.95%. 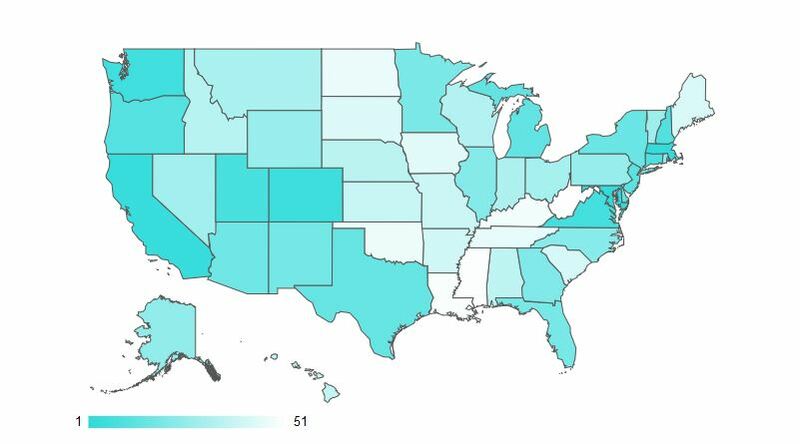 New Mexico has the highest R&D intensity, 6.31%, 19.7 times higher than in Wyoming, which has the lowest at 0.32%.